How can you tell me that going to a movie will make me a better educator? 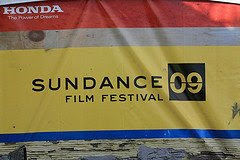 I have been a fan of the Sundance Film Festival for a long time but never could attend. January was a very busy time for me - my classes were finishing the semester and preparing for exams, the soccer program was in full swing with league play underway, and I was meeting with my department members going over their reviews. When I left the classroom, I vowed to keep January open so I could attend Sundance. My expectations were certainly met and even surpassed. Every year (since 2001), I have been going to Sundance except those years when my two children were born. This year, however, I could have gone, but due to several factors - mainly upcoming commitments - I am not attend the festival. Instead, my friend and I have created the Bill/Rob Film Festival where we are spending the week going to one, two or even three movies each afternoon. At first, I felt the need to justify this: "I am working extra hard in the mornings and at night so I can go to the movies". But why? Isn't it OK for me to see a movie? Yes, you are correct. This is more than just one movie. But it does reflect on a condition that we as Americans especially suffer from. We feel that unless we are busy, working hard all the time, we are not being successful or "contributing". This summer, I read Tim Ferriss' book "The 4-Hour Workweek ". In it, the author relates a time when he worked at a job that required him to make sales calls to executives. He found that if he spent an half-hour in the early morning and an hour in the evening making calls, he was more productive (and overall more successful) than his counterparts who spent eight hours calling. The reason: he called either before the the executives' personal assistants got to work or after they had left. These personal assistants were screening the calls and protecting their bosses from the likes of the author. The obvious take-away from this is: "Work Smart, not Hard". But I really focused on the author's other message, namely that even though he was bringing in the business, he was seen as a slacker since he did not make any calls during those other hours. His bosses were short sighted, as many of us are. We tend to encourage those who work hard without really looking at what they are doing and if they are really just spending those hours being busy or are they really doing something. Well, back to the Bill/Rob Film Festival. Certainly, if we can get our work done before the films, we should be OK. But I would say that going to these movies will help us work better. A big part of my passion involves creativity and as Frans Johansson explains in the "Medici Effect: What Elephants and Epidemics Can Teach Us About Innovation ", we need to surround ourselves with new ideas and novel ways of expressing these ideas. Movies help in this end. Finally, going to a movie is fun and setting up our own film festival promises to be a blast. Isn't it OK to have some fun? Followup - We are still working on the schedule for the week and I will update this post with what we saw and how we like / dislike each. But if you have not seen "Slumdog Millionaire", I would certainly recommend it. Also, Sean Penn is fantastic as Harvey Milk in "Milk". and tagged as creativity, culture. Currently, there are 2 comments.